There are currently 37 blog entries matching this tag. Sunday, April 1st, 2018 at 1:16am. 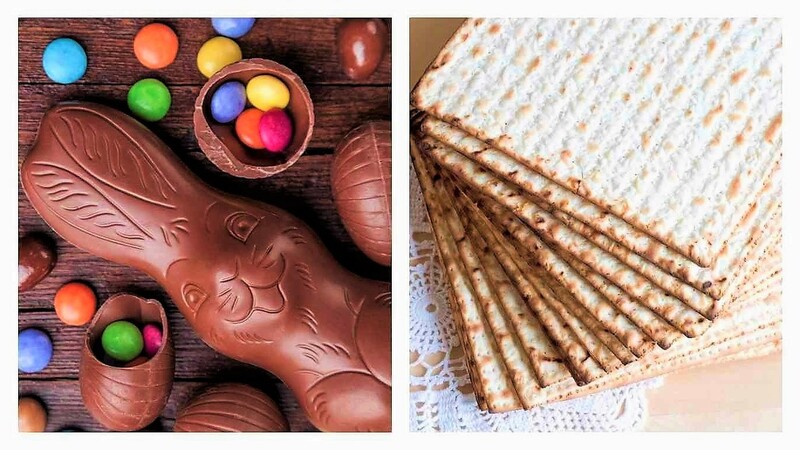 Just as Hanukkah and Christmas share the December holiday season, Passover and Easter frequently overlap in the spring. Within both festivals, nature and history converge with a resounding message of hope. The regeneration of nature that comes with spring and amplifies the promise of redemption embedded in the historical events being commemorated. 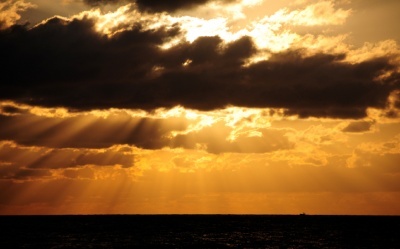 To each faith community, God’s presence manifests itself in two keys, in nature and through history. Tuesday, August 27th, 2013 at 10:42am. 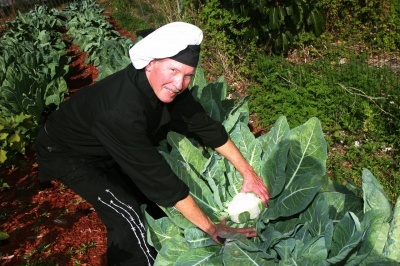 Seeds will be sown Sept. 7 at the Urban Farm in downtown Boynton Beach as part of a program initiated by the nonprofit Taste History Culinary Tours of Historic Palm Beach County. The organization that sponsors trolley-led tastings through restaurant-rich Delray Beach and other South Florida communities has adopted the farm and is recruiting volunteers in preparation for the new harvest season. Thursday, July 18th, 2013 at 3:24pm. 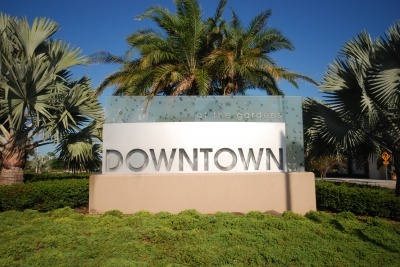 Northern Palm Beach County’s popular open-air restaurant and retail center, Downtown at the Gardens – best known for its modern shops and trendy eateries – has stepped back in time. Way back. 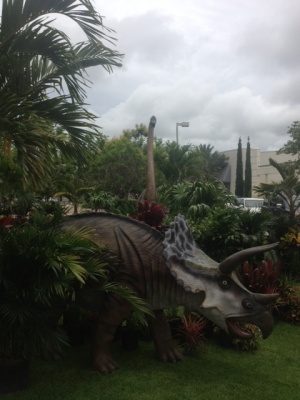 A pair of wayward dinosaurs has made their way to Downtown Park, grazing amid an abundant supply of tropical trees and plants. The dinosaur duo took a detour on the way the Palm Beach Children’s Hospital at St. Mary’s Medical Center in West Palm Beach, where they will star in a whimsical dinosaur garden created by Ashem, a landscape-design firm in Delray Beach, to entertain sick boys and girls. Friday, July 5th, 2013 at 3:02pm. Sunny Florida landed seven out of the 15 locations across the country deemed by industry analyst RealtyTrac as the most ideal for retirees. Those living out their golden years should do so in Naples, North Fort Myers, Punta Gorda or Venice, all in the southwest region of the state; Orange City, near Jacksonville; or Sun City Center, east of Tampa. That’s according to the “15 Best Retirement Hot Spots for Real Estate Investing” list released in July of 2013. Among the categories RealtyTrac used to rate each municipality were percentage of population of retirement age; average temperature; cost of living index; and median sales price. In all of the cities on the list, at least one-third of the population is retirement age. Wednesday, July 3rd, 2013 at 5:01pm. 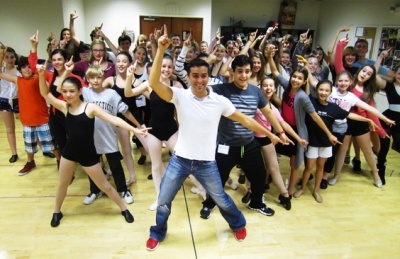 The popular regional theater right around the corner from Waterfront Properties and Club Communities’ headquarters in Jupiter has a summer full of surprises for Palm Beach County youths interested in acting. Maltz Jupiter Theatre’s series of summer camps offers something for children and teenagers from kindergarten through 12th grade. The magic unfolds in the Paul and Sandra Goldner Conservatory of Performing Arts and includes acting, dancing, improvisation, prop-making, singing and storytelling. Each camp concludes with a special show. Tuesday, June 18th, 2013 at 1:17pm. 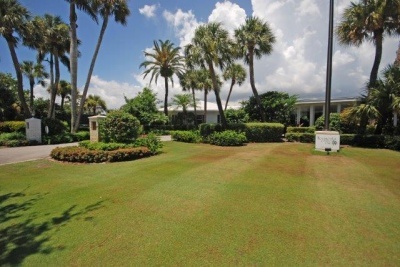 The long-awaited completion of the famed Fazio links at the Tequesta Country Club will take place during the summer of 2013, pleasing both amateur golfers and Tour professionals who have memberships there when it re-opens in November. Tom Fazio II began the project a few years ago with the goal of creating an enhanced natural setting, using plants that require less maintenance. The entire course will be re-sodded. The project also lengthened the course by 350-plus yards, to 6,850, included new bunkers and involved the installation of a new pump system for irrigation. Those with memberships will be able to take advantage of reciprocity partnerships set up with other golf communities in Palm Beach County. Wednesday, May 15th, 2013 at 2:36pm. 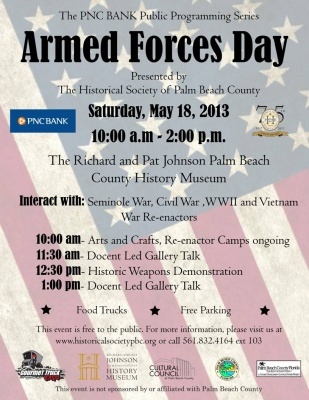 The Historical Society of Palm Beach County will welcome the troops to the Richard and Pat Johnson Palm Beach County History Museum in West Palm Beach for Armed Forces Day on May 18. The free event will entertain and inform all ages and will honor local U.S. Armed Forces, veterans and the nation’s military history. Visitors will learn about the county’s role in past wars and its local battle sites. To help guests interpret Armed Forces Day at the museum, docents will lead them through an authentic front-line camp, to interact with characters from the Seminole War to the Vietnam War, and to inspect Army vehicles. Cards also can be decorated to be mailed to soldiers overseas. Wednesday, January 30th, 2013 at 10:28am. 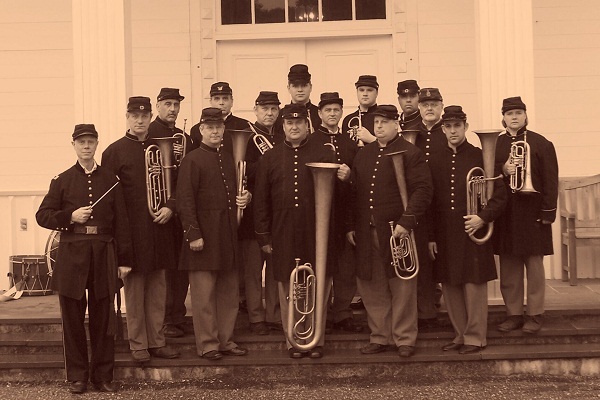 In remembrance of the sesquicentennial of the Civil War (1861 to 1865), the New Gardens Band will welcome The Coates Brass Band: The 47th Pennsylvania Volunteer Infantry Regiment at a special performance Feb. 2, 2013. The “Civil War Concert” will take place at 8 p.m. at the Eissey Campus Theatre, on the campus of Palm Beach State College, in Palm Beach Gardens, Fla. The Coates Brass Band: The 47th Pennsylvania Volunteer Infantry Regiment is comprised of a group of eastern-Pennsylvania musicians who don historic uniforms and recreate the military service of the brass band that served in Key West at Fort Zachary Taylor. The evening will offer a uniquely informative look back in time. Friday, January 25th, 2013 at 10:34am. 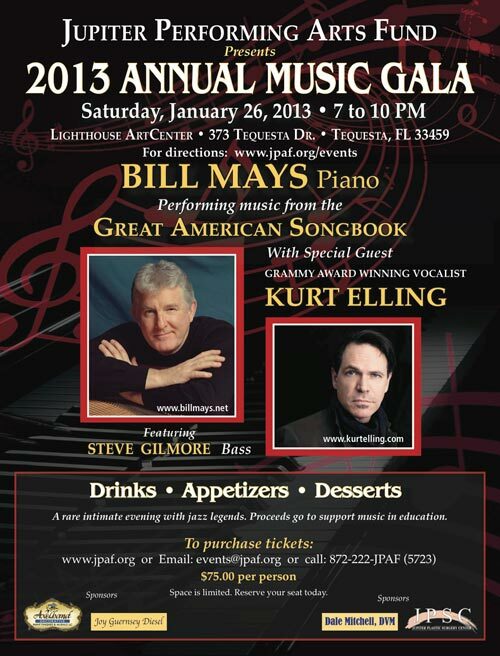 The Jupiter Performing Arts Fund is tuning up for its 2013 Annual Music Gala, featuring accomplished pianist Bill Mays and Grammy Award-winning vocalist Kurt Elling, with Steve Gilmore on bass. Billed as “A Rare Evening with Jazz Legends," the gala will take place from 7 to 10 p.m. Jan. 26 at the Lighthouse ArtCenter Museum and School of Art. The center is in the heart of Tequesta in Gallery Square North. The Jupiter Performing Arts Fund supports music in public schools in Jupiter and surrounding areas by funding scholarships, donating instruments, offering artist-in-residence programs and organizing clinics. Tickets cost $75 and include admission to the gallery, hors d’oeuvres and cocktails, and the performance. For information, call 872-222-5723. Friday, December 28th, 2012 at 11:46am. The gorgeously hand-carved, Florida-theme carousel at Downtown at the Gardens, Palm Beach Gardens’ premier shopping destinations, has turned 2. To celebrate the development near The Landmark condominiums for sale will have a joint birthday / holiday celebration thought Dec. 30 featuring the “Gifts of the Season” campaign. The campaign, conceived by developer Berman Enterprises, funds more than two dozen local charities through proceeds from carousel rides, which, in two years, have amounted to more than $20,000. Kendall Rumsey, director of marketing for Downtown at the Gardens, said “Gifts of the Season” enables the Palm Beach Gardens property to give back to the city and the community at large by helping charitable causes.